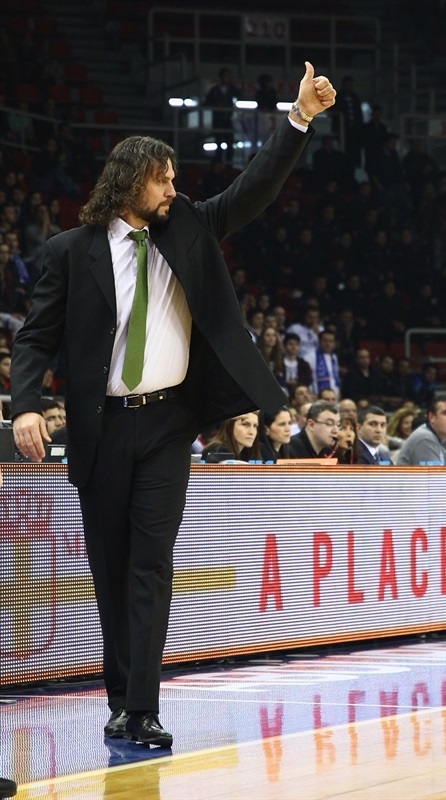 A Euroleague legend as a player, Fragiskos Alvertis made a successful and a dramatic coaching debut as Panathinaikos Athens pulled out a 60-65 overtime road win over Anadolu Efes Istanbul on Friday night. The Greens improved to 5-5 and a share of third place in Group E, while Efes dropped to 2-8, seventh place, and is all but mathematically eliminated from reaching the playoffs. Neither team held more than a 6-point lead throughout the game. Kostas Vasileiadis led an 11-1 run that put Efes up 37-31 in the third, and Zoran Planinic scored 7 points in the fourth to keep the hosts in front. But Jonas Maciulis sent the game into overtime with a tough triple, his only of the game, with 13 seconds left in regulation, and Antonis Fotsis had a three-pointer and a basket-plus-free throws in the extra session, putting Panathinaikos in front for good. Fotsis finished with 14 points and 6 rebounds, Stephane Lasme collected 11 points, 12 rebounds and 2 blocks, while Maciulis netted 8 and pulled down 6 boards in victory. 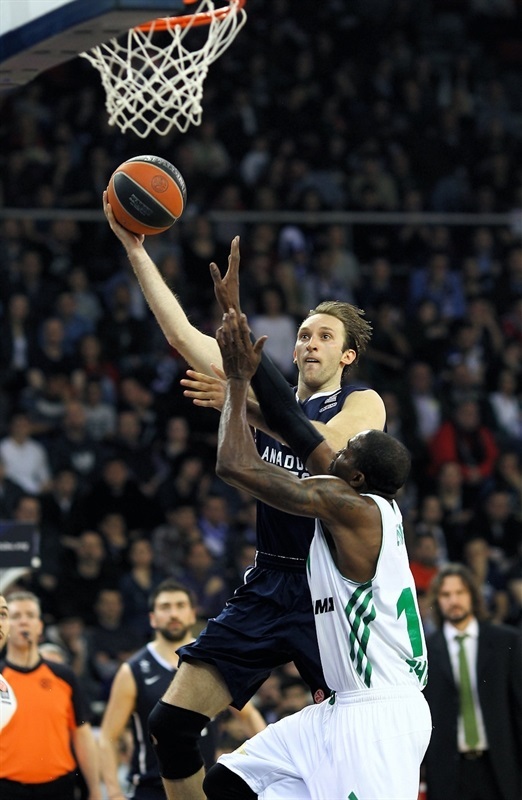 Planinic had 15 points, 7 rebounds and 3 assists to pace the hosts. 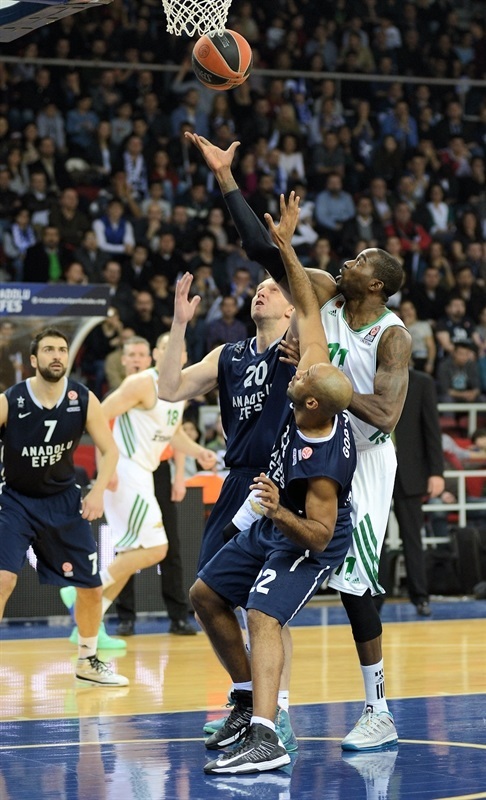 Vasileiadis scored 10, and Kerem Gonlum had 9 points and 7 rebounds in defeat. After Fotsis opened the game with a three-pointer, Roko Ukic followed it with a fastbreak tip-in. Vasileiadis nailed a triple to open Efes's account, but Panathinaikos dominated the offensive glass early on, grabbing 6 offensive rebounds. Diamantidis drove for a second chance layup, then nailed a jumper to make it 3-9. 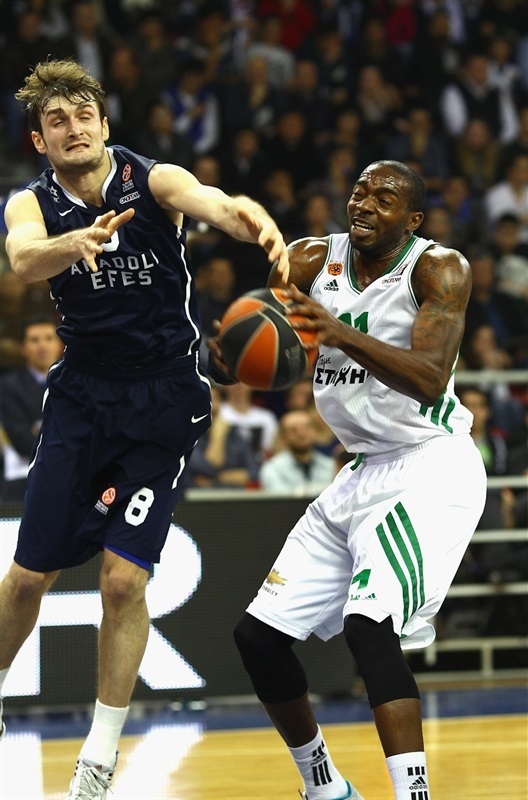 However, Efes stepped it up on defense, leaving the visitors scoreless for more than six minutes. Meanwhile, Savanovic scored a short jumper to spark a 7-0 run. He also contributed with a put-back, and a pair of free throws from Planinic put the hosts up 10-9 before Lasme ended the Green's drought with a dunk in the final seconds of the quarter for a 10-11 lead. It was a slow start to the second quarter before Planinic drove coast-to-coast for a layup. Zach Wright answered with a layup, then Lasme had a pair of baskets from close range to make it 12-17. After a timeout, Milko Bjelica buried a triple for the hosts and Gonlum put them back in front with a put-back-plus-free throw. Wright split defenders in driving to the hoop on the other end, but Bjelica banked in a shot and finished a breakaway with a slam for a 22-19 edge. After a timeout, Vasileiadis hit a long jumper extending the margin to 5 points, but Fotsis answered right back with a three-pointer, snapping a 12-2 spurt. Then Diamantidis scored an uncontested layup to tie things at 24-24. 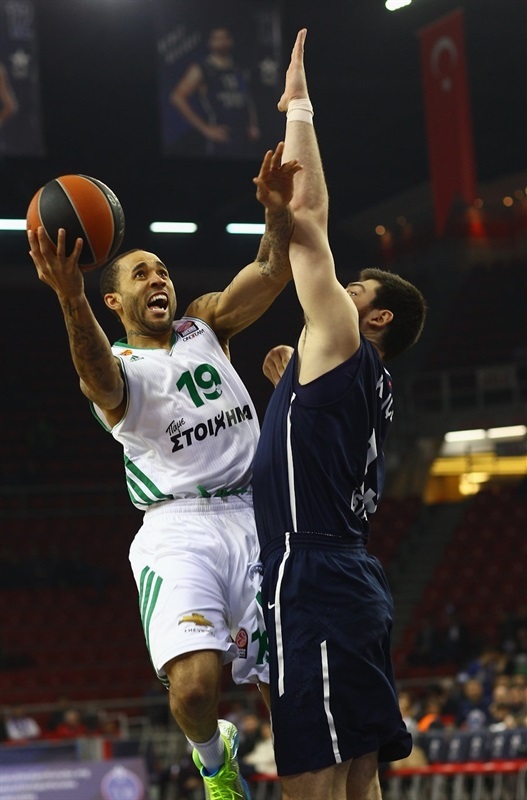 After Gonlum scored from close range, Michael Bramos made 2 foul shots, and Mike Batiste on a fastbreak put-back of his own miss gave Panathinaikos a 26-28 halftime lead. Maciulis drove for a layup for the visitors, and Savanovic hit a baseline floater at the start of the quarter. 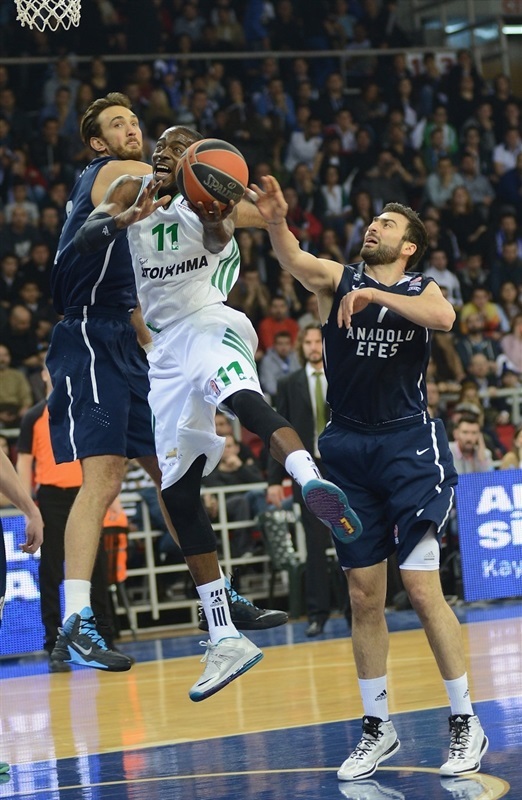 Jamon Gordon nailed a three to make it 31-31, and Vasileiadis hit one of his own to put Efes back in front. 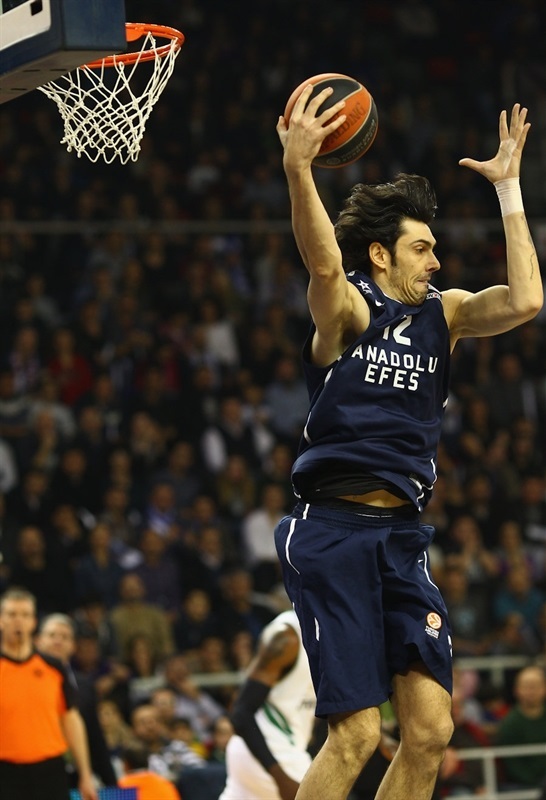 Vasileiadis then raced for a fastbreak layup, helping Efes to a 37-31 lead. 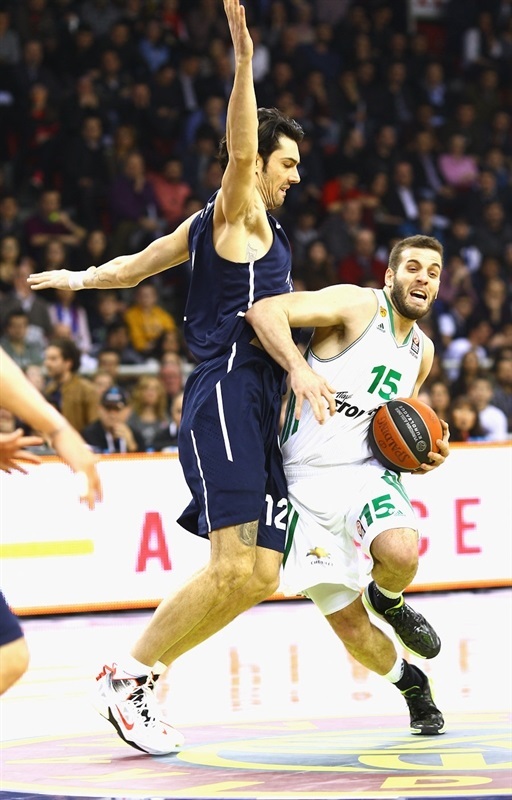 Fotsis scored inside to snap an 11-1 run, and after Planinic drove to sink a layup high off the glass, Lasme hit a baseline jumper as Panathinaikos cut it to 39-38. Birkan Batuk hit a corner triple for Efes, but Batiste scored a jump shot, made both free throws, and Wright finished the quarter with a fastbreak layup, making it 42-44. Batuk hit a three-pointer, and after Ukic and Planinic traded shots from downtown, Planinic drove for a layup and a 50-47 lead. After a timeout, Bramos hit a second-chance triple, but Gordon answered by driving for a layup. Planinic extended the margin to 4 points with a jumper, and in the next four minutes the hosts’ defense only allowed a free throw to Ukic. Efes entered the final 30 seconds of regulation up 54-51, but Maciuis sank an off balance three-pointer 13 seconds to go to tie it. The hosts had the last possession, but Planinic was off on a jumper, as the game went into an extra session. Gonlum scored a layup on the opening possession of the overtime, but Maciulis scored from close range for Panathinaikos, and Fotsis buried a triple to make it 58-59. Ukic split free throws, and Gonlum scored a put-back to tie the game at 56-56 entering the final minute. But Ukic assisted Fotsis for a dunk-plus-free throw, before Diamantidis and Lasme each hit a hit a free throw to seal the deal.